SunBriteTV, LLC SB-V-55-4KHDR-BL - The sunbritetv veranda series are safer and provide superior performance and durability than indoor televisions used in outdoor installations. Built for permanent outdoor installation in shaded locations, veranda has an operating temperature range of -24 to 105°F, and storage temperature range from -24 to 140°F New 2019 version - weatherproof outdoor television - sunbritetv 55" true outdoor 4k hdr television - the Veranda Series TV is optimal for full-shade outside living areas like a covered patio or screened gazebo. 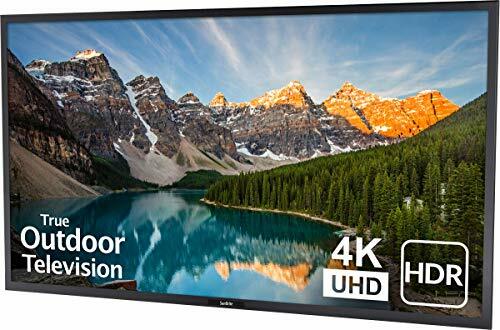 Upgraded ultra 4k hdr screen - the latest model in the sunbritetv veranda Series offers a premium 4K UHD HDR screen with direct LED backlight and is up to 50% brighter than indoor TVs to deliver a breathtaking, vivid picture in outdoor environments. Rugged case and components designed for permanent outdoor installation - SunBriteTV's durable aluminum case protects against rain, extreme temperatures, salt, dust, snow, and insects; compared to the lightweight, vented plastic of typical indoor TV cases. Includes speakers - veranda Series includes built-in speakers and a generous media bay for popular streaming devices. Supports connections for multiple media sources - hdmi 2. 0 and hdcp 2. 2 to help ensure compatibility with 4k sources; equipped with 3 HDMI and 1 USB inputs for variety of connectivity options, as well as HDMI ARC on 1 input, and both IR and IP control. SunBriteTV Weatherproof Outdoor 55-Inch Veranda 2nd Gen 4K UHD HDR LED Television - SB-V-55-4KHDR-BL Black - Rust-proof powder-coated aluminum exteriors, dust, moisture, fully resisting rain, large media bays and installer-friendly cable-entry systems retain the SunBriteTV weatherproof standard, grease and insects. While up to 50% brighter than an indoor television, Veranda is designed for full-shade applications, where the majority of residential televisions are installed outdoors. SunBriteTV, LLC SB-DC-VS-55A - Premium outdoor dust cover for landscape sb-s-55-4k / sb-5574uhD Premium dust cover for veranda Series & Signature Series 55" 4K UHD outdoor TV. Constructed with weatherproof 4-ply polypropylene UV protection fabric. Velcro straps at the bottom for a secure fit. Protects the sunbriteTV outdoor TV screen from scratches when not in use.